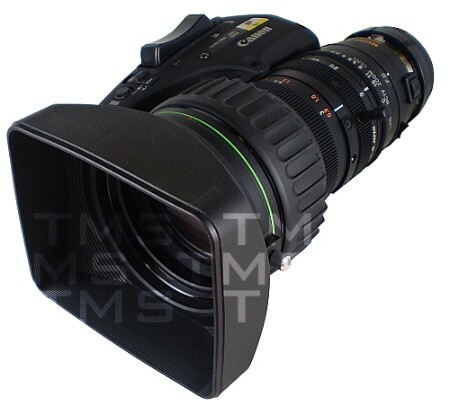 Canon YJ19x9B KRS 2/3" IFpro lens. Advantages of IF technology include reduced chromatic aberrations, high and flat MTF, ergonomic grip, special protein paint, and the trademark IF square hood which eliminates ghosting and flare, and allows for creative filter work. Responding to the increasingly high standards of Pro-Video users, the Canon 19X IFpro lens excels with a 30% faster zoom motor, and Canon's exclusive Shuttle Shot technology, which allows operators to zoom back and forth instantly between any two positions, at the touch of a button. The IFpro lens offers some important user benefits including: reduced chromatic aberrations for increased resolution, decreased flare, and enhanced production value. IF technology also allows users a higher level of creative filter use, since the front of the barrel does not turn when focusing.